Revolutionalize the way you do your weeding with this wiggling Flexrake Hula-Ho Weeder. It features a high-carbon, heat-treated blade for strength of construction, and has a hardwood handle. Flexrake was an innovator in hand tool manufacturing in the 1940s when its founder George Brock invented the modern lawn rake, and it remains Americas number one brand name in rakes today. It was founded in 1945 in response to the economic boom following WWII, and it has been a family owned and run company ever since. Today Flexrake remains dedicated to American manufacturing, specializing in the production of lawn, garden and dog clean-up tools. The company manufactures products that cover a wide variety of uses, including weeding, digging, cultivating, and more. High-carbon and heat-treated wiggle blade. Features 54-in. premium-grade hardwood handle. Made in the USA. Overall dimensions: 4L x 6W x 58H in.. Overall dimensions: 4L x 6W x 58H in. Bully Tools bow rakes feature extra thick 10 gauge steel. The connection to the handle is welded and will not separate. The triple wall fiberglass handle resists breakage while still being lightweight and easy to handle. 15 Flat Tine Expandable Head. Adjust the rake width to a tiny 7 inchs for tight areas. This rake is designed to go in smaller areas that are difficult for conventional rakes. Expands to a full 22 inches. Do you have the right gardening tool required to perfectly formed bed of soil? 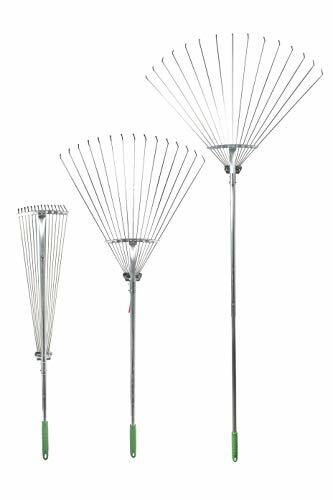 Garden rake are mainly used to prepare soil for the plants that will grow there, but they can also remove weeds, sculpt the soil into rows and beds or improve its structure to allow air and water to penetrate more easily to the roots of plants. Metal rake is essential for every gardener. 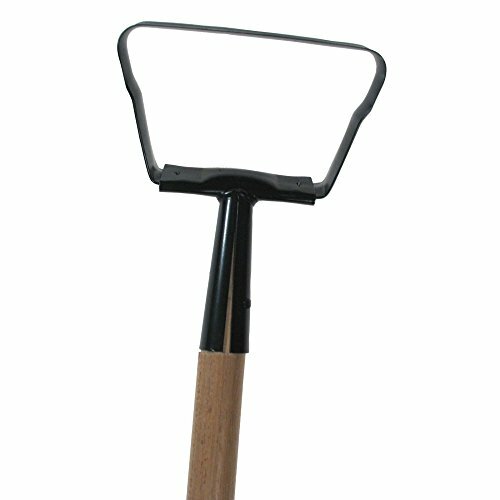 - The best cultivator garden tool on the market! Perfect Pulverized and Aerated Soil - Guaranteed! You can now perfectly break and loosen the soil into smaller pieces to allow air and water to penetrate deeply into the soil and drain more effectively with this 5 tines claw rake. Use it after mulch rake and your garden will get the best treatment from the ultimate combo. The tines won't break off, unlike any look alike product, because Gardener's Claw Rake(TM) is made of military grade steel which is super strong, lightweight, weatherproof, and long lasting. You can practically use our garden cultivator for a lifetime. Plus, it won't give your hand and wrist fatigue thanks to its ergonomic wooden handle. What are you waiting for? Get your soil loosen perfectly by using this gardener's claw rake and complete your japanese garden tools. Claw Size: 3.3" x 3.9"
SUPERB 5 TINES CLAW RAKE - With its 5 tines, this hand cultivator will perfectly break and loosen the soil into smaller pieces to allow air and water to penetrate deeply into the soil and drain more effectively. Small garden rakes are very useful for your backyard garden because it has many functions all at one. MILITARY GRADE STEEL AND WOOD MATERIALS - The materials of the steel rake are super strong, lightweight, weatherproof, rust resistant, and require less maintenance. This hand rake definitely will stay with you for a lifetime. You'll get the quality as sturdy as a digger! SUPER EASY TO STORE WITH HOOP RING - This rake clam can be easily stored in your garage when not in use during evening or off-season with the hoop ring. Its compact length of 15.1 doesn't need much space to store. It's also light and easy to hold on to a small rake when you move around the garden. GET IT NOW! - Just like cultivator for crop, clam rake is for your garden. Clam rakes are simple gardening tools for women, men, basically anyone! Get the best garden hand tools to loosen the soil in your garden perfectly. Hurry and place your order now! Ultra-light rake, rugged construction. Strong wrap around bracing and heavy-duty double-ribbed construction for stability and long-lasting performance under the heaviest professional use. Has a 66 inch coated handle with permanent 5 inch vinyl comfort grip. Most popular professional industry standard. Rounded teeth for a smooth non-gouging action. Striking edge is excellent for grading. This is one of the best priced adjustable rakes on the market. 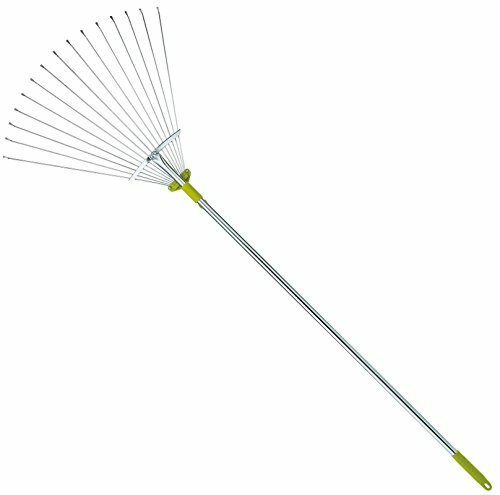 This excellent all purpose rake adjusts in two ways. It telescopes from 37 inches to 68 inches for all your raking needs. Also, the tough steel tines adjust from 7.5 inches to 21.75 inches wide. Great for working under hedges and in flower beds. It's the versatility of this rake that makes it such a find. The fan head adjusts with an easy movement and the handle telescopes quickly easily. Besides the usual uses for a garden rake, the smaller head allows you to rake in between perennials and not damage the plants. It also is ideal for raking out debris from window wells, under hard to get at places or in the middle of dense flower beds. The rake is made from aluminum alloy so it is both strong and lightweight - a bonus when there are a lot of heavy leaves to lift up. Also, with the adjustable fan, it folds to a tighter profile so that it is less apt to be damaged while being stored between raking jobs. 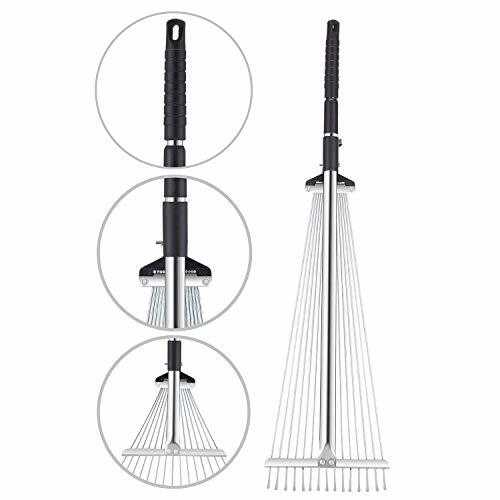 ADJUSTABLE RAKE - This excellent all purpose rake adjusts in two ways. The fan head adjusts with an easy movement and the handle telescopes quickly easily. It telescopes from 37 inches to 68 inches for all your raking needs. Also, the tough steel tines adjust from 7.5 inches to 21.75 inches wide. MULTI-FUNCTIONAL - Great for working under hedges and in flower beds. It's the versatility of this rake that makes it such a find. 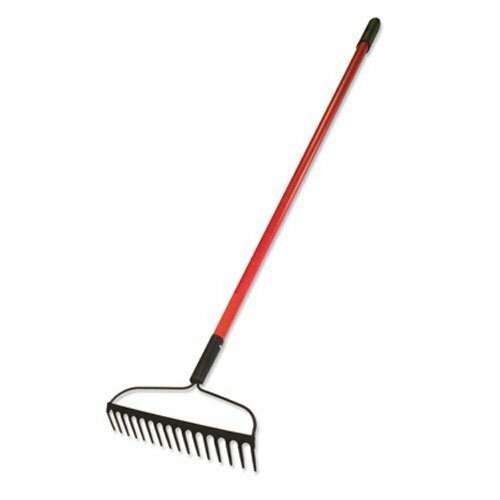 Besides the usual uses for a garden rake, the smaller head allows you to rake in between perennials and not damage the plants. It also is ideal for raking out debris from window wells, under hard to get at places or in the middle of dense flower beds. HIGH-QUALITY - The rake is made from aluminum alloy so it is both strong and lightweight - a bonus when there are a lot of heavy leaves to lift up. Also, with the adjustable fan, it folds to a tighter profile so that it is less apt to be damaged while being stored between raking jobs. ERGONOMIC RUBBERIZED HANDLE - Yard work might not be everyone's idea of fun, but you don't have to be uncomfortable while you rake. The Professional EZ Travel Collection Telescopic Rake is simply more comfortable to use than others thanks to the easy-grip rubberized handle. The Fiskars aluminum leaf rake features a patented design with curved tines that grab leaves without clogging to help you get all of your raking done faster. An extra-long handle improves posture and reduces back fatigue so raking is easier, too. The durable resin tines are designed to flex without breaking, so they'll stand up to heavy use season after season. The strong aluminum handle provides lasting durability while reducing weight for easy use, and a teardrop-shaped shaft profile provides exceptional comfort and control. 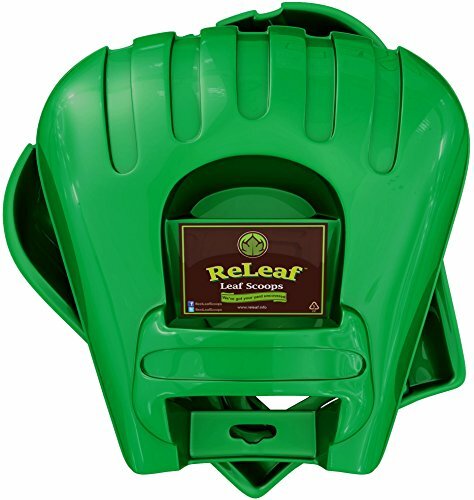 A must-have garden tool for raking up clippings, leaves, and other light lawn and garden debris. Adjustable Leaf Rake allow you to quick clean up leaves,lightweight and easy to use. The overall length of the rake is 32'' collapsed and 52'' in extended. This handle pole is made by strong and high-grade steel ,strong and sturdy enough. 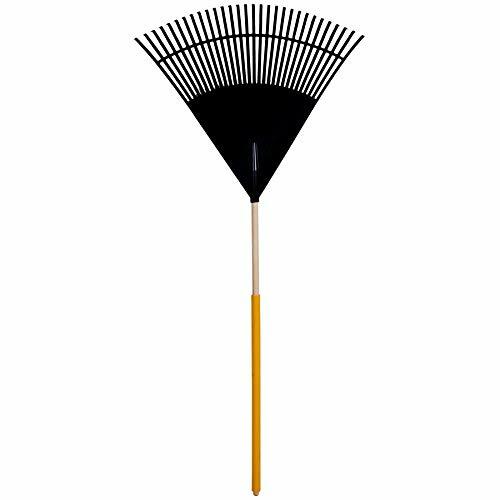 1.This tool is an ideal leaf rake not meant for cement raking or heavy duty debris. 2.Please reduce it to a minimum when you are not using it to save space. LONG HANDLE & EXTENSION PPLE: People can choose the appropriate length according to their height. And long handle allow you to Stand upright for comfortable. Can adjust overall length from 32 to 52 inches by twisting the handle clockwise. SAVE TIME: The rake handle is made of steel and is more durable. Super large width of head is 17.8in. more carpet in less time for efficient cleaning. Light weight and easy to use,the rake is an ideal turf rake. SAVE YOUR SPACE: The Winslow&Ross Artificial Turf Rake folds quickly and easily for storage. There is a hole at the top of the rake pole,you can hang it up when not in use to save space.It also can be stored in minimum space. Multi-Use: The turf rake can clean leaves and small debris on the artificial lawn. Even dog and cat hair on the carpet/rug can be easily cleaned. It also doesn't cause damage to most carpet fibers, making it safe even for daily use. PRODUCT WARRANTY: If you experience an issue with your Winslow&Ross product, get in touch with us to repair or replace it. Risk-free guarantee provides a reliable purchasing experience to you.What are you waiting for? Add to cart Now! 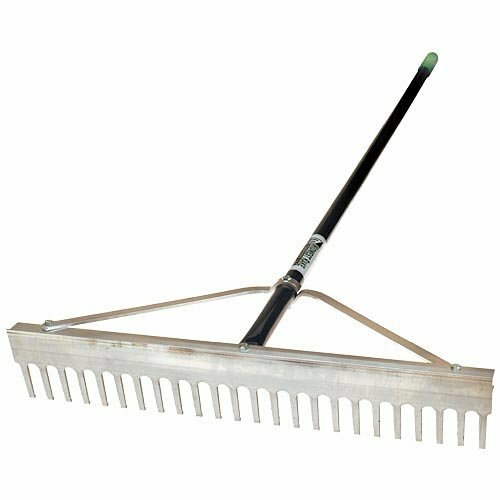 15 teeth metal rake head with adjustable width extend from a tiny 7.5 inches to a full 22 inches, adjustable handle Length from 29.5 inches to a fully 61 inches. The rake teeth are made of galvanized steel wires to prevent rust. 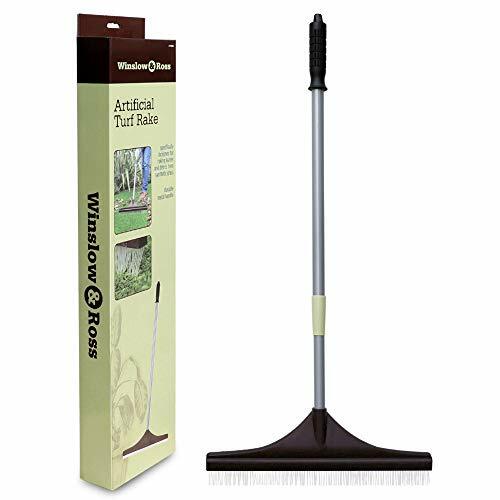 Fully mirror polished metal tubular pole and ergonomic plastic handle, lightweight, rust resistant and easy to clean. Ergonomic handle provides exceptional grip and reduces stress on your hands from gardening activities. Locking switch is made perfectly to meet the most demanding use, which is flexible and reliable. Perfect for sweeping leaves and lawn waste. U.S.based seller,Order with confidence! The 100% customer satisfaction guarantee means exactly that. We will fix any problem quickly and are always ready to help our customers.